Insular biogeography is a field within biogeography that examines the factors that affect the species richness of isolated natural communities. The theory was originally developed as island biogeography, to explain species richness of actual islands, principally oceanic. Under either name it is now used in reference to any ecosystem (present or past) that is isolated due to being surrounded by unlike ecosystems, and has been extended to mountain peaks, oases, fragmented forest, and even natural habitats isolated by human land development. The field was started in the 1960s by the ecologists Robert H. MacArthur and E. O. Wilson, who coined the term island biogeography in their theory, which attempted to predict the number of species that would exist on a newly created island. For biogeographical purposes, an insular environment or "island" is any area of habitat suitable for a specific ecosystem, surrounded by an expanse of unsuitable habitat. While this may be a traditional island—a mass of land surrounded by water—the term may also be applied to many nontraditional "islands", such as the peaks of mountains, isolated springs or lakes surrounded by desert,, and non-contiguous woodlands. The concept is often applied to natural habitats surrounded by human-altered landscapes, such as expanses of grassland surrounded by highways or housing tracts, and national parks. Additionally, what is an insular for one organism may not be so for others, some organisms located on mountaintops may also be found in the valleys, while others may be restricted to the peaks. The theory of insular biogeography proposes that the number of species found in an undisturbed insular environment ("island") is determined by immigration and extinction. And further, that the isolated populations may follow different evolutionary routes, as shown by Darwin's observation of finches in the Galapagos Islands. 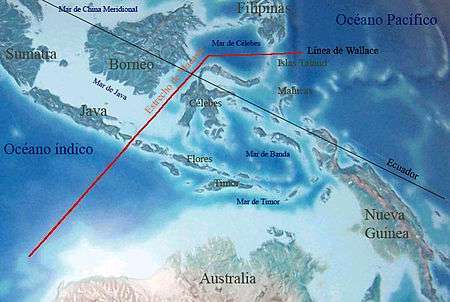 Immigration and emigration are affected by the distance of an island from a source of colonists (distance effect). Usually this source is the mainland, but it can also be other islands. Islands that are more isolated are less likely to receive immigrants than islands that are less isolated. The rate of extinction once a species manages to colonize an island is affected by island size; this is the species-area curve or effect. Larger islands contain larger habitat areas and opportunities for more different varieties of habitat. Larger habitat size reduces the probability of extinction due to chance events. Habitat heterogeneity increases the number of species that will be successful after immigration. Over time, the countervailing forces of extinction and immigration result in an equilibrium level of species richness. This diagram shows the effect of an island’s distance from the mainland on the amount of species richness. The sizes of the two islands are approximately the same. 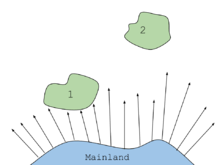 Island 1 receives more random dispersion of organisms, while island number two, since it is farther away, receives less random dispersion of organisms. This diagram shows the effect of an island’s size on the amount of species richness. 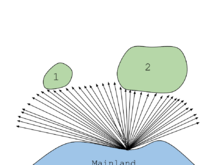 The diagram shows two islands equidistant from the mainland. Island 1 receives less random dispersion of organisms. While island 2 receives more of the arrows and therefore more random dispersion of organisms. In addition to having an effect on immigration rates, isolation can also affect extinction rates. Populations on islands that are less isolated are less likely to go extinct because individuals from the source population and other islands can immigrate and "rescue" the population from extinction; this is known as the rescue effect. In addition to having an effect on extinction, island size can also affect immigration rates. Species may actively target larger islands for their greater number of resources and available niches; or, larger islands may accumulate more species by chance just because they are larger. This is the target effect. The theory can be studied through the fossils, which provide a record of life on Earth. 300 million years ago, Europe and North America lay on the equator and were covered by steamy tropical rainforests. Climate change devastated these tropical rainforests during the Carboniferous Period and as the climate grew drier, rainforests fragmented. Shrunken islands of forest were uninhabitable for amphibians but were well suited to reptiles, which became more diverse and even varied their diet in the rapidly changing environment; this Carboniferous rainforest collapse event triggered an evolutionary burst among reptiles. The theory of island biogeography was experimentally tested by E. O. Wilson and his student Daniel Simberloff in the mangrove islands in the Florida Keys. Species richness on several small mangroves islands were surveyed. The islands were fumigated with methyl bromide to clear their arthropod communities. Following fumigation the immigration of species onto the islands was monitored. Within a year the islands had been recolonised. Islands closer to the mainland recovered faster as predicted by the Theory of Island Biogeography. The effect of island size was not tested, since all islands were of approximately equal size. Research conducted at the rainforest research station on Barro Colorado Island has yielded a large number of publications concerning the ecological changes following the formation of islands, such as the local extinction of large predators and the subsequent changes in prey populations. Within a few years of the publishing of the theory, its potential application to the field of conservation biology had been realised and was being vigorously debated in ecological circles. The idea that reserves and national parks formed islands inside human-altered landscapes (habitat fragmentation), and that these reserves could lose species as they 'relaxed towards equilibrium' (that is they would lose species as they achieved their new equilibrium number, known as ecosystem decay) caused a great deal of concern. This is particularly true when conserving larger species which tend to have larger ranges. A study by William Newmark, published in the journal Nature and reported in the New York Times, showed a strong correlation between the size of a protected U.S. National Park and the number of species of mammals. This led to the debate known as single large or several small (SLOSS), described by writer David Quammen in The Song of the Dodo as "ecology's own genteel version of trench warfare". In the years after the publication of Wilson and Simberloff's papers ecologists had found more examples of the species-area relationship, and conservation planning was taking the view that the one large reserve could hold more species than several smaller reserves, and that larger reserves should be the norm in reserve design. This view was in particular championed by Jared Diamond. This led to concern by other ecologists, including Dan Simberloff, who considered this to be an unproven over-simplification that would damage conservation efforts. Habitat diversity was as or more important than size in determining the number of species protected. Island biogeography theory also led to the development of wildlife corridors as a conservation tool to increase connectivity between habitat islands. Wildlife corridors can increase the movement of species between parks and reserves and therefore increase the number of species that can be supported, but they can also allow for the spread of disease and pathogens between populations, complicating the simple proscription of connectivity being good for biodiversity. In species diversity, island biogeography most describes allopatric speciation. Allopatric speciation is where new gene pools arise out of natural selection in isolated gene pools. Island biogeography is also useful in considering sympatric speciation, the idea of different species arising from one ancestral species in the same area. Interbreeding between the two differently adapted species would prevent speciation, but in some species, sympatric speciation appears to have occurred. 1 2 Brown, James H. (1978). "The Theory of Insular Biogeography and the Distribution of Boreal Birds and Mammals" (PDF). Great Basin Naturalist Memoirs. 2: 209–227. SA Code A78BRO01IDUS. The present paper compares the distribution of boreal birds and mammals among the isolated mountain ranges of the Great Basin and relates those patterns to the developing theory of insular biogeography. 1 2 3 Sahney, S.; Benton, M. J.; Falcon-Lang, H. J. (2010). "Rainforest Collapse Triggered Pennsylvanian Tetrapod Diversification in Euramerica" (PDF). Geology. 38 (12): 1079–1082. doi:10.1130/G31182.1. ↑ MacArthur, Robert H.; Wilson, E. O. (1967). The Theory of Island Biogeography. Princeton, New Jersey: Princeton University Press. ↑ Newmark, W. D. (29 January 1987). "A Land-bridge Island Perspective on Mammalian Extinctions in Western North American Parks" (PDF). Nature. 325: 430–432. doi:10.1038/325430a0. ↑ Franzén, Markus; Schweiger, Oliver; Betzholtz, Per-Eric (January 2012). "Species–Area Relationships Are Controlled by Species Traits". PLOS ONE. San Francisco, California: Public Library of Science. 7 (5): e37359. doi:10.1371/journal.pone.0037359. ↑ Simberloff, Daniel; Wilson, Edward O. (March 1969). "Experimental Zoogeography of islands - colonization of empty islands" (PDF). Ecology. Ecological Society of America. 50 (2): 278–296. doi:10.2307/1934856. Retrieved 2010-09-26. ↑ Lomolino, Mark V. (January 2000). "A Call for a New Paradigm of Island Biogeography". Global Ecology and Biogeography: A Journal of Macroecology. Wiley. 9 (1): 1–6. doi:10.1046/j.1365-2699.2000.00185.x. ↑ Quammen, David (1996). The Song of the Dodo: Island Biogeography in an Age of Extinctions. Scribner. p. 446. ISBN 0-684-80083-7. Schoenherr, Allan A.; Feldmeth, C. Robert; Emerson, Michael J. (2003). Natural History of the Islands of California. University of California Press.